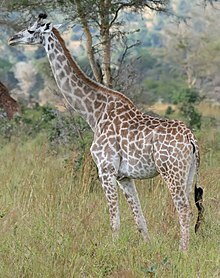 Ang hirapa (Giraffa camelopardalis) maoy mamiperong makit-an sa Aprika. ↑ Grubb, P. (2005). "Giraffa camelopardalis". in Wilson, D. E.; Reeder, D-A. M. Mammal Species of the World: A Taxonomic and Geographic Reference (3rd ed. ), Johns Hopkins University Press. p. 672. ISBN 978-0-8018-8221-0. OCLC 62265494, http://www.bucknell.edu/msw3/browse.asp?id=14200476. ↑ Fennessy, J.; Brown, D. (2008). Giraffa camelopardalis. In: IUCN 2008. IUCN Red List of Threatened Species. Downloaded on 2009-03-13. Kining maong panid kataposang giusab niadtong 5 Oktubre 2014 sa 20:51.